There is much talk about defending the land from the sea. But what consideration has been given to defending the sea from the land? I propose to create a new sea defence that not only defends the sea from land-based pollutants (plastics, sewage etc) but also helps cleanse the sea of pollutants at the same time! It is proposed that an amphibious glue-like substance is researched (and if necessary developed) and applied to surfaces along vulnerable stretches of sealine (existing seawalls, gabions, cliffs etc) and that we allow nature to do the work. On average there are an estimated 46000 pieces of plastic in every square mile of sea. These plastic pieces move around our oceans like a giant soup, washing in and out of our shores with the tide. 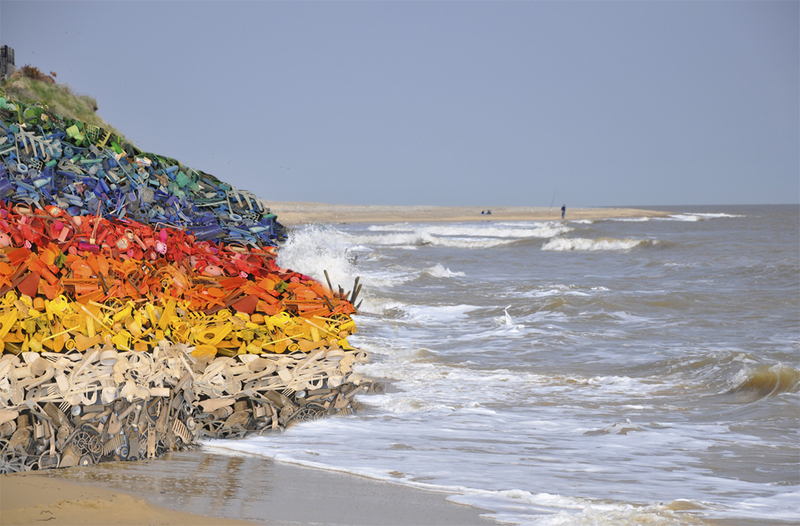 On exceptional tides, the plastics thrown up by the tide (I estimate there to be thousands per every kilometer of UK coastline) will adhere to the sea walls, reinforcing them with plastics, creating an accreting rainbow reef of 100% recycled colourful plastic, protecting the sea from the land and also the land from the sea. And at the same time helping to free the sea from the pollutants that threaten to swamp it! If you would like to help make this idea a reality please contact seawall@flyintheface.com. Expertise in amphibious glue-like substances is particularly sought for this project. We hope that this will be just the first of an innovative range of sustainable ‘lateral’ solutions to the growing issue of sea defences so if you have alternative ideas for protecting the sea from the land & its pollutants which you would like to explore with us, please do get in touch.